BZS.1958.106.1671 (obverse). Depiction of St. Longinus. μεθ᾽ ἑτέρων γυναικῶν καὶ «Οἴμοι» ἔλεγεν. «ἀλλὰ δός μοι, ἀγαθέ, λόγον τῇ δούλῃ σου. «ὑποφέρεις τὸν δεινὸν ἐν ξύλῳ θάναντον. τὴν καρδίαν,» ἡ ἁγνὴ ἔλεγεν κλαίουσα. alas! and it hurts my heart,"
the Pure One spoke weeping.Nicholas I Mystikos, Miscellaneous Writings, 88–91. 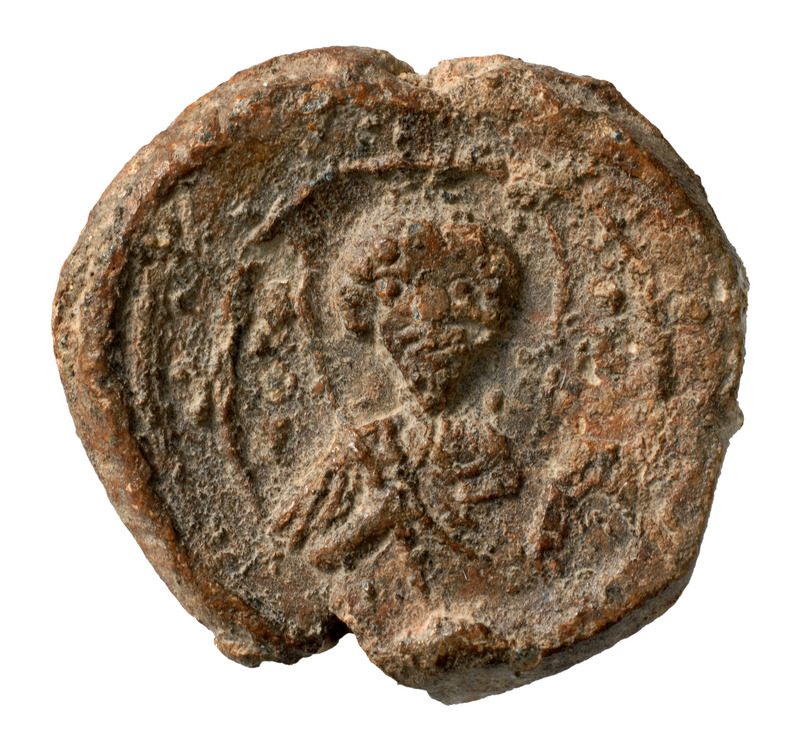 The Crucifixion is found on eleven Byzantine seals ranging from the sixth to the twelfth centuries. 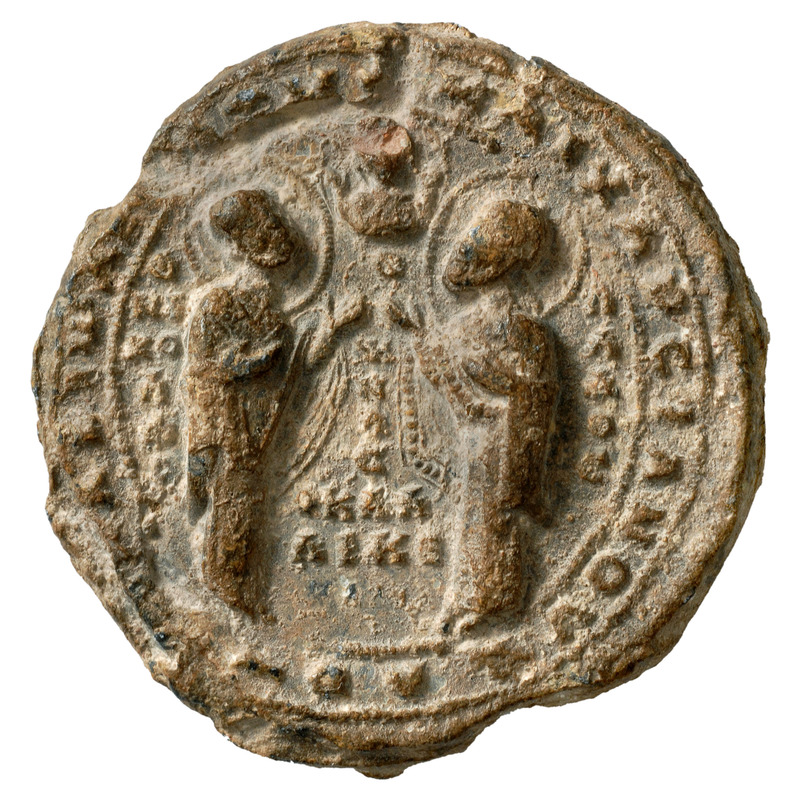 Above is the standard Middle Byzantine scene depicting the crucified Christ flanked by the Virgin and St. John the Evangelist.Cotsonis, "Narrative Scenes on Byzantine Lead Seals," 58 and 65. Occasionally, iconography was chosen for reasons beyond individual piety. The seal here, belonging to Michael chartoularios of the dromon and of Charsianon, exemplifies this. The reverse depicts Nicholas and Menas Kallikelados, raising their hands toward a medallion of Christ. The same design was also used by Constantine vestarches, judge of the Velum, and grand kourator of the sekreton of the Mangana, a nephew of Patriarch Michael I Keroularios. The iconography was likely a “family design,” linking members across time and space.